The article deals with the problem of treatment of periimplantitis which is one of the most severe complications in the implant practice of a dental doctor. 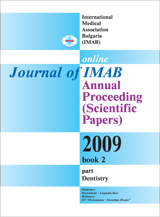 The author suggests a new method of treatment of periimplantitis which is substantiated by his clinical research and observations. The clinical comparative study demonstrates the reliability of this method as compared to the conventional methods. Key words: periimplantitis, dental lasers, general osteotropic treatment.